How much energy does your single-family homereallyuse? MyHomeEQ automatically pulls in all your household information and determines what you can do to save the most on your energy costs. There are many home improvements that can help you reduce the energy usage of your home. Let us help you choose ones that work for you. Select a certified local contractor that specializes in home efficiency. Our contractors are licensed, bonded and insured in their fields. Built for the Real Estate industry. Understanding your actual energy usage is the first step in making your home more comfortable, efficient, and valuable. We'll recommend home improvements that have both immediate and long lasting impact and then we'll help you with the details of making the change. That's why we're here. MyHomeEQ is only available for single family homes in Northern Illinois. 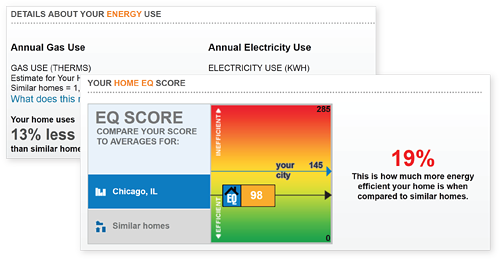 For more information saving energy in a condo or apartment, review the Ways to Save at Energy Impact Illinois. Each home improvement that we recommend will save you money on your utility bills. This is the estimated annual savings from completing all the recommended improvements. That's real money back in your pocket. Your Energy Quotient, calculated from your actual gas and electricity usage and home details, tells you how you're doing and how you compare to others. This lower your score is, the less energy you use. Even with excellent long-term payback, we understand that home improvements cost money upfront. We can link you with financial incentives that can save real money. We’re here to make it easy. It’s simple. A more energy efficient home means a lower MyHomeEQ and bill. That also means a cozier home with better efficiency. Calculate your Energy Quotient. You'll find out how your home compares to others like it in your hometown. Recommend improvements. 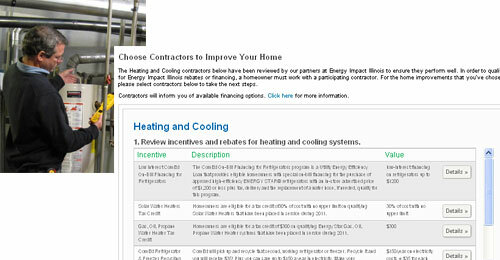 You'll receive suggestions for energy efficient improvements you can make that are tailored to your home. Connect you with contractors. Choose from a list of trusted contractors who will work with you to make the improvements you decide to make. All of the service providers listed are local, licensed, bonded, and insured. Review and then automatically request a quote. Link you with financial incentives. 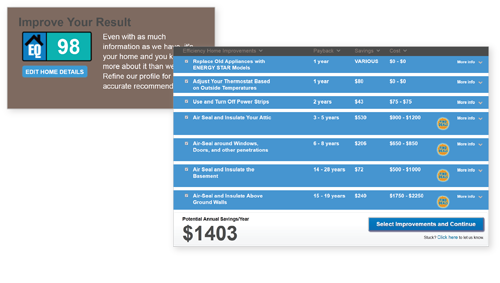 Home energy improvements can be costly with paybacks stretched out over time. We've collected information that will help you find incentives to lower your initial costs. A more comfortable home. You'll notice the cool, drafty spots in your home become warmer and you can stop compensating by overheating the rest of the house. Lower utility bills. The price of energy varies, but it typically rises over time. With energy improvements, you'll see savings on your utility bills now and in the future. Improve the market value of your home. We're working with realtors to make a home's energy efficiency an important selling point. As your home's EQ goes down, the value of your home will go up.